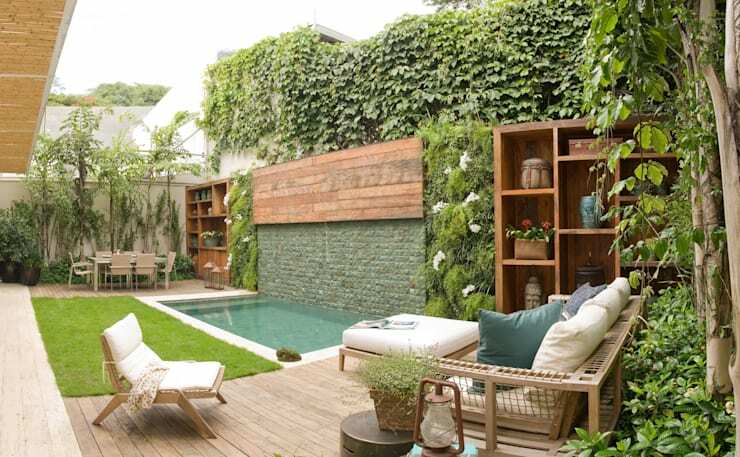 As South Africans are very well aware, gardens are very important features when it comes to home design. They are spaces where we can relax and enjoy the fresh air and the beauty of nature. We can also forget about the pressures of everyday life. While we spend a lot of time on the interior design of a house, the garden design should be just as important. It is also the first impression that people will get of our home when they approach it from the exterior, so it should pack a punch. A garden design should enhance the atmosphere of nature through the addition of environmental elements such as plants and trees. However, there are other elements you can add to the exterior space such as fountains and swimming pools. Fountains are a beautifully innovative feature that can add a distinctive touch of sophistication to the garden and house as a whole. 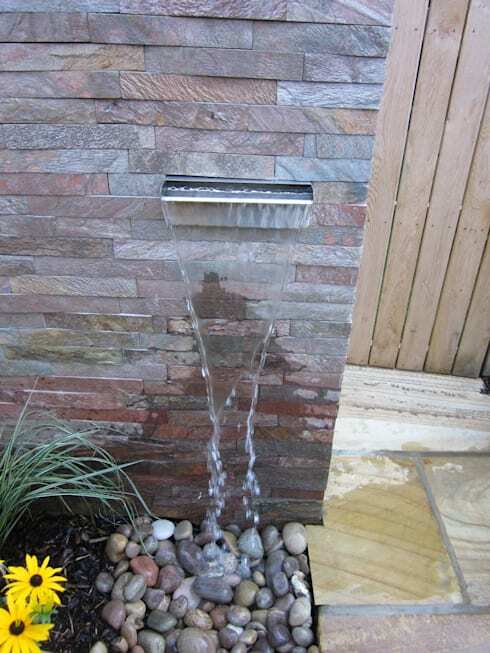 Wall fountains, however, are gaining popularity at the moment! They can be used outside or inside of the home, bringing nature into any room of the house. 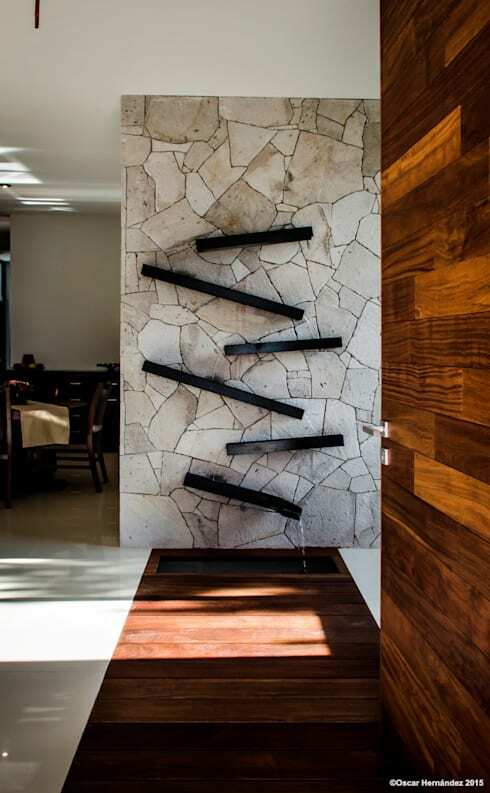 Today on homify, we are going to explore 15 wall fountains that you can make in your home! Shall we take a look? 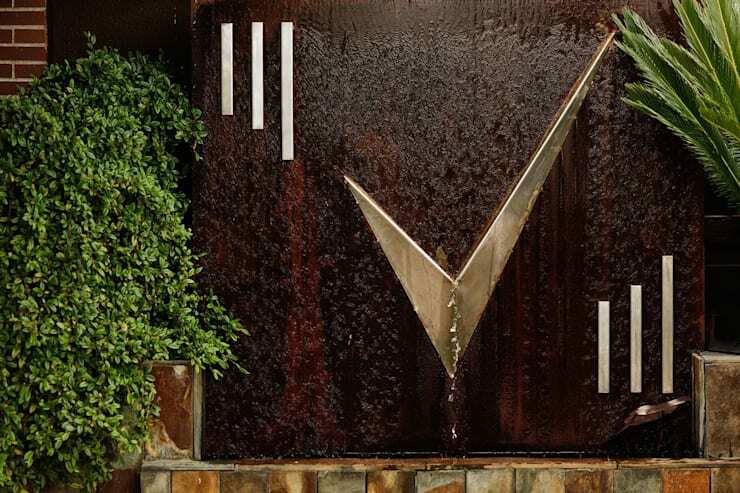 This distinctive design shows how unique and edgy wall fountains can be. This marble wall separates the garden from the entrance of the house, creating a beautiful atmosphere that introduces nature into the home. This is based on a Scandinavian style, where black wooden panels contrast beautifully with the light marble and allow the water to fall in a very elegant way. 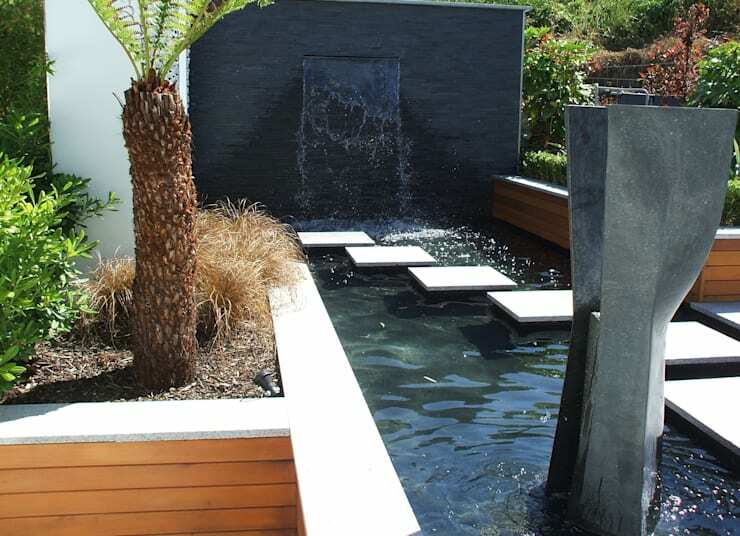 This small little fountain hangs in one corner of the garden, designed by professionals Earth Designs. This is a great example of how simplicity can sometimes be the most elegant option. The small, colourful stones below it add that final touch. In one corner of the garden, a stone wall has been installed with a small fountain. The water runs into a little concrete pond. The simple green plants contrast beautifully with the stone wall, creating an atmosphere of calm and relaxation. 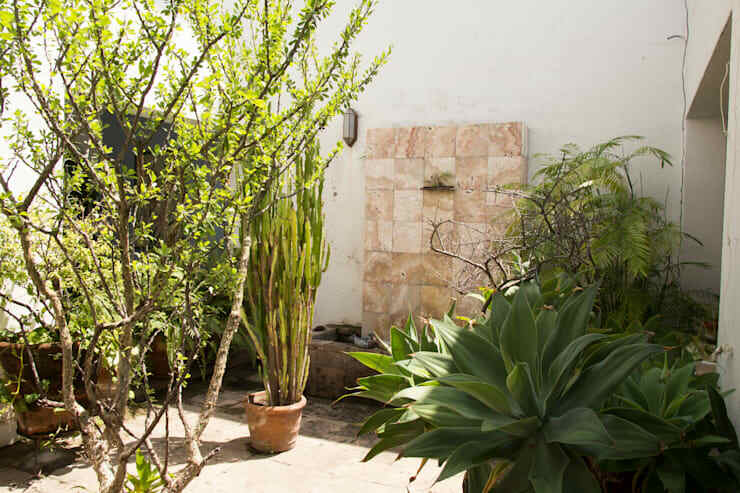 This stylish garden also features a stone wall, but this time it is above the swimming pool. 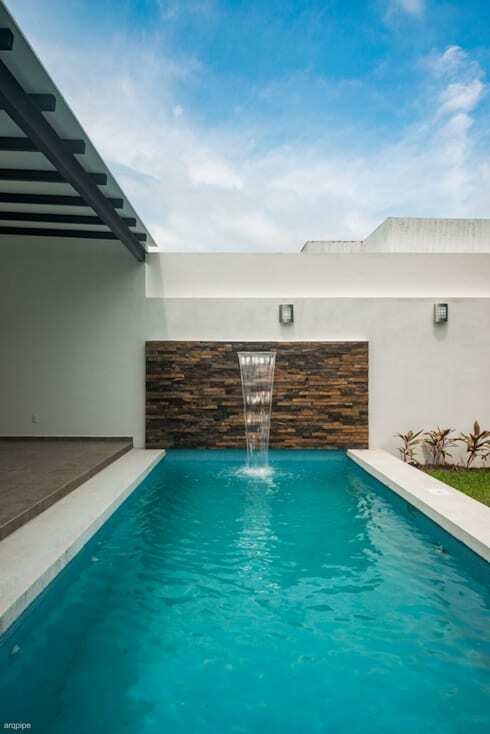 Water flows into the pool like a small waterfall, creating a very natural and refreshing environment. This is a very modern design characterised by a combination of simplicity and elegance. The unique fountain wall features a round reflector plate that works beautifully with the stone design. 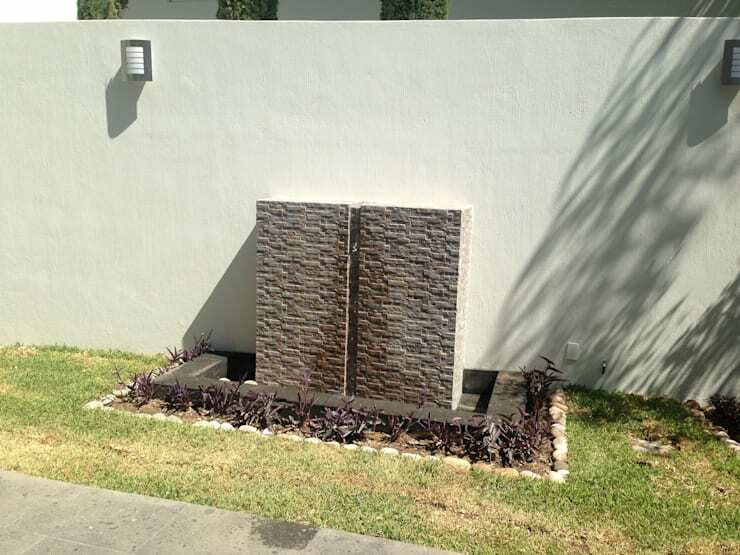 An innovative way to design a wall fountain is to go for this option. It could also be a fun DIY project! 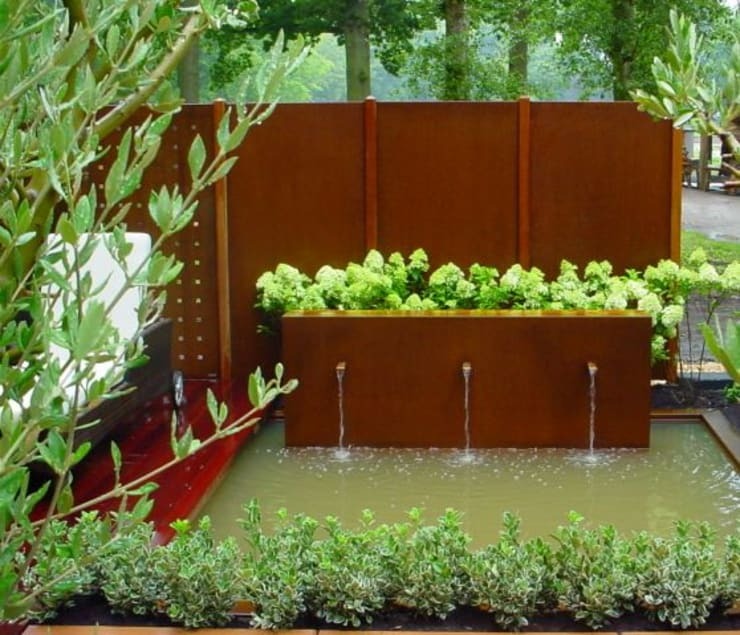 The small rectangle troughs feature beautiful plants as well as a water fountain that allows the water to spurt out in three distinct units. This small floor fountain was designed in one corner of the garden. Despite the small size it adds a distinctive touch to the garden. This is a very easy design that can be built over a short amount of time! This classic fountain is installed in a stone wall, where water falls from a high level into the gorgeous little rustic swimming pool. The rectangular shape is very distinctive! The green plants and lush trees add a warm and relaxing touch to the exterior space. 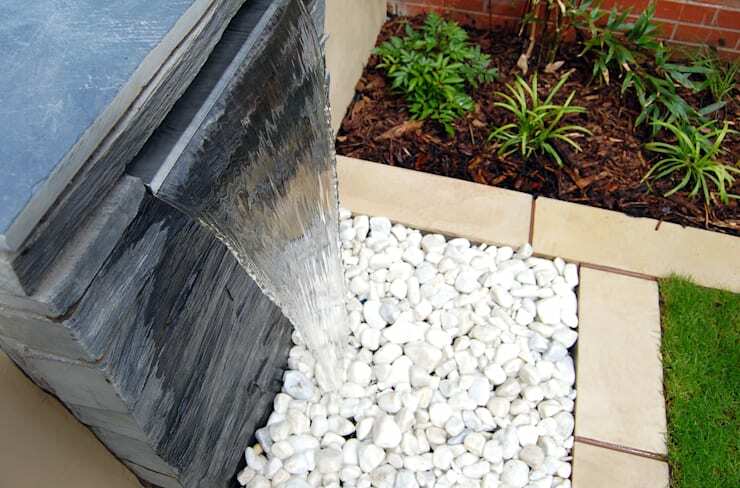 You can really exploit your outdoor spaces by designing the wall fountain so that it looks like a natural waterfall. In this elegant black design, we can see how the wall of water creates a beautiful and sophisticated design. It looks like a small river flowing in the swimming pool! Don't you love the stones that looks like they are floating in the water? This creates a very picturesque appearance. This fountain wall features a very edgy, innovative and unique design with an incredibly modern pattern. The water sprays across the wooden wall, which has been designed with two straight metal lines that intersect. The green plants add to the look and feel, reinforcing the feeling of a charming atmosphere that is natural and refreshing. 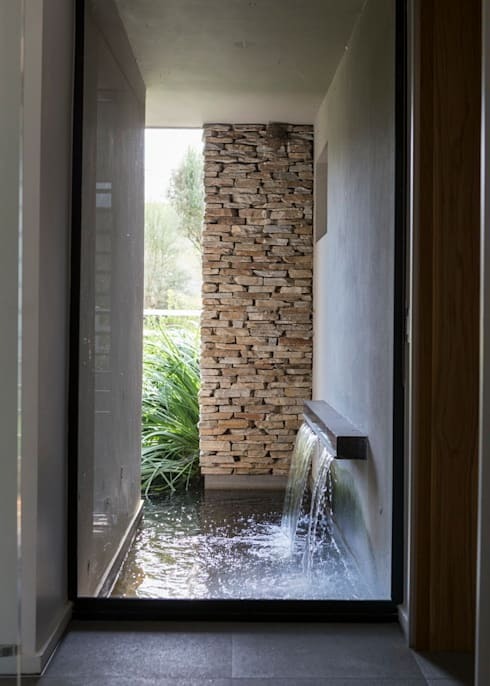 On one side of the house, these South African designers have installed a little waterway that looks like a small river. The fountain has been installed in a concrete wall, allowing the water to drip into the waterway in a soothing and serene way. You can implement this design in any part of your garden, no matter what size it is. A little fountain has been installed on a small wall, with a basin of striking white stones. This enhances the mix of textures and tones, creating a very natural and refreshing look and feel. The green plants add a nice aesthetic touch. This outdoor area is a wonderful space for relaxation, peace and quiet. The elegant wood and rustic bricks add a sense of serenity and calm to the space, while the green vertical garden makes for a natural and striking design. Don't you love the wooden shelves, which allow flowers, pot plants and accessories to be put on display? This really creates an outdoor area of charm and personality. Have a look at these tips: How can I create and plant a vertical garden? 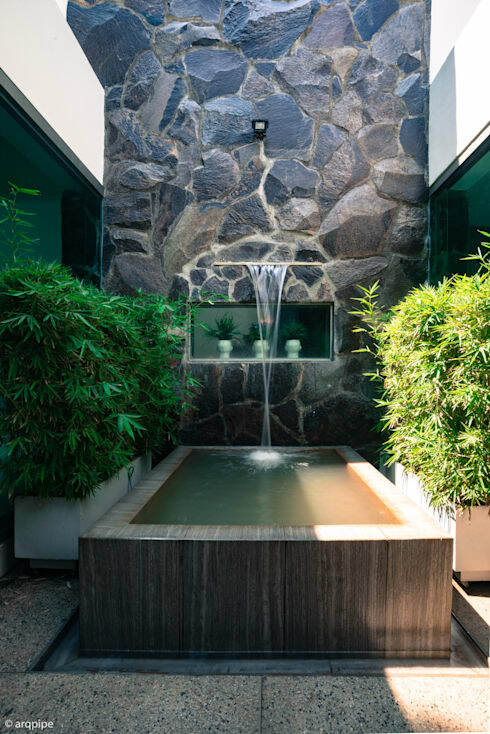 This house is designed with a tropical style, which is further enhanced by the gorgeous stone wall fountain. A chunky stone basin catches the water, which overflows onto a bed of brown stone. It truly looks like a small river runs through this home! Don't you love the mix of materials, which create a truly unique, textured environment? 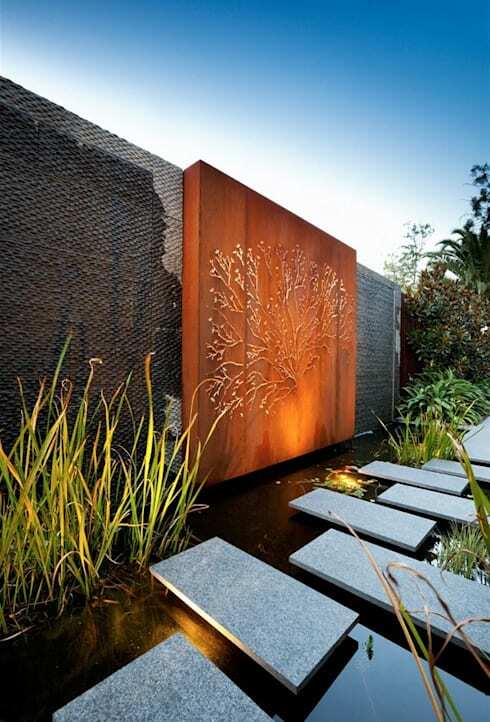 Designed in a very sophisticated way, this fountain features a stylish wooden wall with a gorgeous tree sculpture that has been suspended across it. This is a very refreshing design that is further enhanced by the dripping water that runs into the pond below it. The lights below it further enhance the details of this outdoor space, creating an area that is sure to be a true source of inspiration! If you've enjoyed this article, you'll love this one too: Stunning water features that work in any home! Also have a look at these 12 mouth-watering modern South African patio and garden ideas. 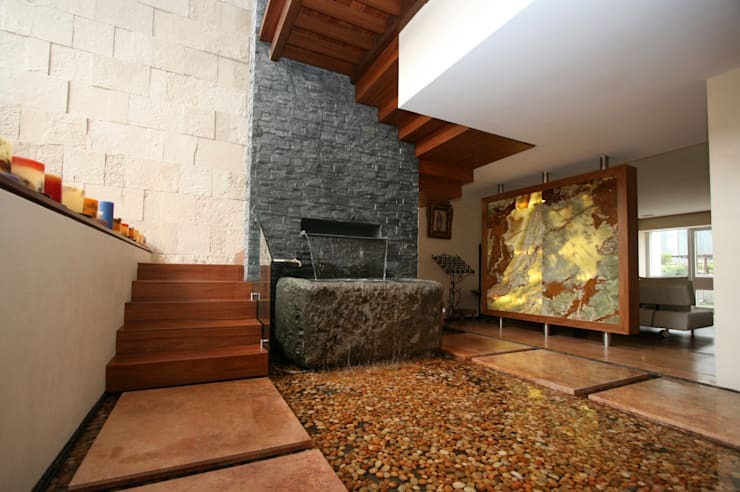 Would you choose a wall fountain for your home?